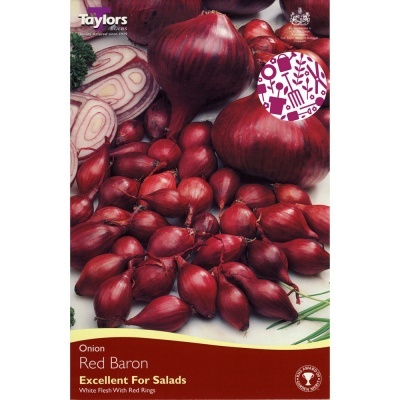 Taylors Bulbs Red Baron Onion Sets Pack of 50 are an excellent variety for salads with white flesh and red rings, ideal for those who prefer a stronger flavour onion. A late planting onion producing uniform red onions with dark skin. 'Red Baron' produces a high yield and is excellent for storing. 50 sets Supplied - Enough for a 5m/17ft row.